The celebration took place at a Plymouth Holiday gas station that received funding from the BIP program. Minnesota Department of Agriculture Deputy Commissioner Andrea Vaubel spoke at the event, along with representatives from both Sen. Amy Klobuchar and Sen. Tina Smith’s office. Kelly Novak, Energy Program Manager, U.S. Department of Agriculture’s Farm Service Agency, traveled to the Twin Cities to commemorate the great success of the program in Minnesota. The owners of the Holiday location also spoke about their commitment to ethanol-blended fuels. Through the BIP program, the U.S. Department of Agriculture awarded Minnesota $8 million for ethanol infrastructure development to make cleaner-burning ethanol fuels more accessible. Along with state funds, MCGA joined Growth Energy’s “Prime the Pump” program and ethanol producers to invest a total of $14 million in ethanol infrastructure in 2015. MCGA made the investment as part of its ongoing efforts to help grow ethanol as a market for the state’s corn growers. The additional infrastructure has sparked tremendous growth in sales of ethanol-blended fuels, and provided corn farmers with an additional market for their product. This is especially important for growers who are now experiencing their fifth consecutive year of depressed commodity prices. In 2014, only 14 retailers sold 88 Octane in Minnesota. As locations surpassed 250 in 2017, sales followed: More than 19 million gallons of 88 Octane were pumped in 2017—a 230-percent increase over the prior year. Nearly 50 million gallons of 88 Octane have been sold through October in 2018. The growth in stations offering E85 has also ignited sales. Last year was the highest volume of E85 sold at nearly 14.5 million gallons. That record will be broken in 2018, with sales already surpassing an estimated 15 million gallons through October. The investment by MCGA in ethanol infrastructure is only part of its comprehensive efforts to promote the use of ethanol-blended fuels. 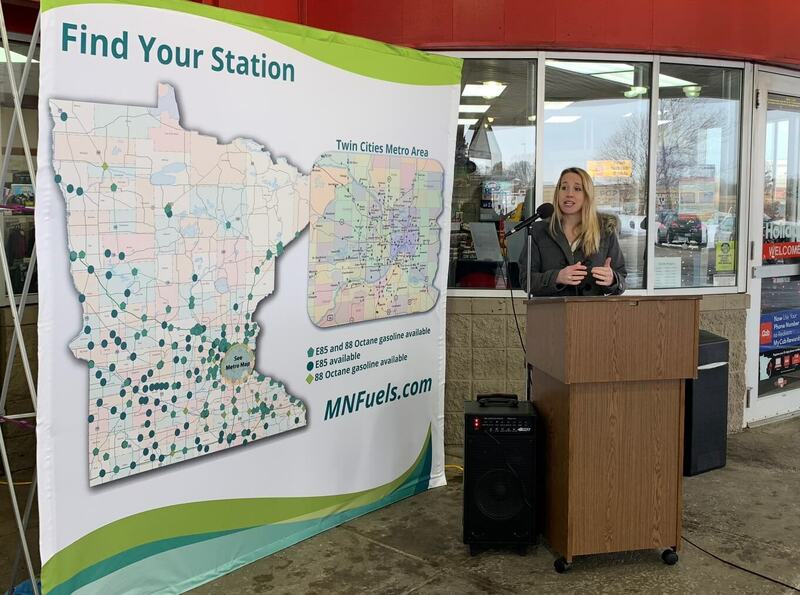 Earlier this year, MCGA unveiled a revamped MNFuels.com, now featuring a station locator that makes it easier than ever for consumers to find 88 Octane and E85 on the road. MCGA also recently worked with the American Lung Association to hold fuel promotion events at stations throughout the state to discuss the benefits of ethanol with consumers. A large advertising campaign, funded by MCGA, promotes ethanol-blended fuels on the radio and on billboards throughout the year.